The Democrat media calls an Trump insane, greedy businessman, and treat Hillary, whose greed they cover up, like a goddess. But most of the people recognize the insanity of the liberal media propaganda. Liberal media stories bashing Trump as a dangerously unstable psychotic sociopath who shouldn’t touch the nuclear button, while worshipping Hillary as a goddess, have reached such colossal proportions that even the most ignorant are seeing the media’s psychosis. Don “Black Hole” Lemon at CNN, the priceless gem of galactic stupidity where intelligence goes to die by being sucked up into nothingness, argued psychotically with Secret Service Agent Dan Bongino. When Bongino pointed out that the leftwingnut media was claiming Trump called on people to shoot Hillary, Lemon said that no one in the liberal media said that, and then proceeded to spend the rest of his time defending the leftwingnut media story that that’s what Trump did! The leftwingnut media have become so deranged that they think they can cover up the fact that people cannot see what they are doing, i.e., deliberately distracting the public from Hillary’s emails by claiming Trump is saying such horrible things that he is forcing them to cover his insanity instead. It’s a media narrative designed for the some of the people who can be fooled all the time, but they actually think they can fool all of the people all the time. The result – CNN’s ratings have plunged below MSNBCs! 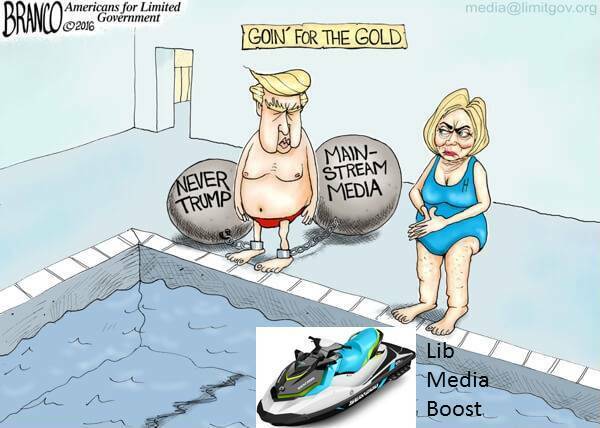 You have to make an effort to be that bad, the worst of the liberal media, and CNN has succeeded in winning the gold medal for the Yellow Journalism Olympics. All of this comes on the heels of Trump and Clinton announcing their plans to save America’s economy. While the billionaire businessman announced plans that have been prove eminently successful in the past, Hillary announced that she will not only continue Obama’s policies, but expand them. As Democrats destroy American energy they will again make America slaves to Arab oil, and add Chinese coal thanks to Obama shutting down coal mining that runs America’s electricity. This is why liberals are saying there won’t be enough electricity in twenty years to power laptops. Polls today showing Hillary is loved and Trump reviled are not reflecting public opinion, but attempting to shape it. 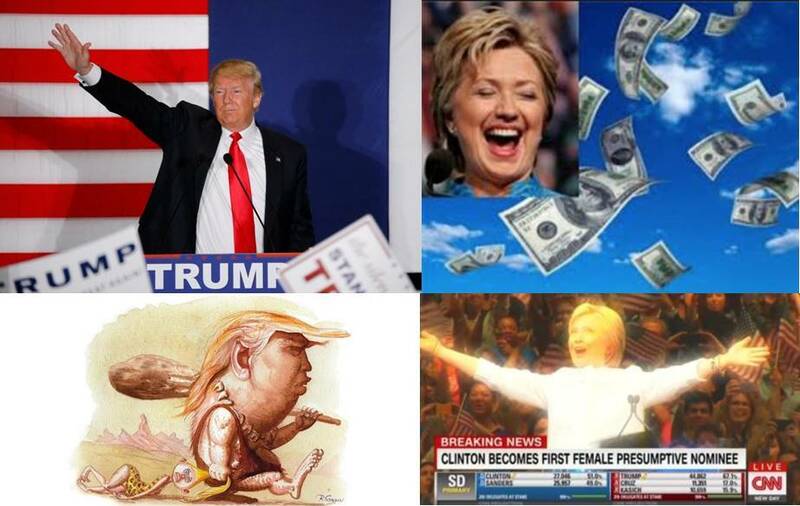 Where The Donald promises to renew the Reagan/Gingrich era of economic growth through low taxation, less regulation, and congressional spending reform, Hillary and the liberal media’s scorn him. Clinton says she can fix America’s economy by continuing and expanding Obama’s economic plan, and idiots cheer her for wanting to make government bigger and increasing the pay in the public sector; pay that comes from taxpayers. The government has no money except that which it takes from the private sector. Despite Obama’s claims that he lowered taxes, those with a functioning brain who watch what he does know he made the largest peace time tax increases since Jimmy Carter. This is why there are fewer Americans working today than during the Carter era. And his elimination of Gingrich’s welfare reforms that he forced on Clinton in the 90s is the reason taxpayers are being asked to contribute more to redistribute to the deadbeats that are Obama’s welfare voter slaves. The deniability of implication and public ignorance is what the left uses to leave them the ability to deny what they say and mean. Everybody with a brain sees it. The liberal Democrat media think they can imply, or outright declare Trump to be an unstable, violent racist, and then deny doing so because they didn’t use the actual words or verbiage thrown back in their faces. They think they can laud Hillary as enlightened and progressive when her policies would regress America into penury. But every intelligent, moral person knows that they lie to America and to themselves, and that the only people who believe them are as self-deluded as they. This is the mental instability and immorality of the ignorance of liberalism. Hillary Clinton mocks Donald Trump’s economic plan as the “failed theory of trickle-down.” Trickle-down economics is no theory and no failure but the proven fact of economics and how business works. The only time it doesn’t work is when socialists steal from those who produce to give to those who do not. Hillary says Trump is only out to serve himself, to have it all for himself and make himself and his rich friends richer. But those with the knowledge that Obama and Hillary have spent the last eight years making their cronies on Wall Street, their donors, and foreign governments richer at the expense of the American taxpayer see right through the least transparent government in American history. Trump is brash and honest, but he doesn’t always speak correctly. His saying that “Obama is the Founder of ISIS” isn’t factual, but if he said, “Obama is the Father of ISIS” he would be exactly on point. It is Obama’s actions, his foreign policy, that created ISIS. Obama’s support for the Muslim Brotherhood, arming jihadis, and assisting them to overthrow governments, plus his precipitous withdrawal of U.S. troops from the region that led directly to the formation and founding of ISIS. In contrast to Trump, Hillary gives 96% of her charitable donations to herself, just as Al Gore buys “Carbon Credits” from a company he owns! Hillary’s Secret Economy: The Rich didn’t get Richer – Democrats did! This entry was posted in Election 2016 and tagged 2016 Presidential Campaign, Democrat media propaganda, Donald Trump, Elections 2016, Hillary Clinton, Hillary's economic plan, Leftwingnut media, Liberal media propaganda, Media goes nuclear on Trump, Reaganomics vs. Obamanomics, Trump's economic plan. Bookmark the permalink. One reason why Trump has spent so little on his campaign (compared to others – I think $60M is a lot, but so what?) is because he has the media in his back pocket. Trump is a very shrewd person who most likely (I don’t know the guy – so I’m not speaking for him) knew his politically incorrect statements would incur the wrath of the media. He also knew that exposing them, the RINO’s and the warmongers would wake up the public to the uniparty and media lies. So far its worked. Now that the Guardian, and Reuters chimed into our elections, and Trump doing an amazing job of connecting with the voters, the voters distrust the media and their polls even more than they did before. Whether Trump wins or not, he unleashed a wave of awakening and there is nothing anyone can do to stop it. If all Trump did was destroy the main stream media and the Democrats’ cronies, I would consider his candidacy an astounding success. Hillary Clinton gets away with what she does because the cronies protect her. With good investigative journalism, she wouldn’t stand a chance.